The first reviews of the Apple iPhone have appeared online in the US, ahead of the product's launch this Friday, 29 June. "Our verdict is that, despite some flaws and feature omissions, the iPhone is, on balance, a beautiful and breakthrough handheld computer. Its software, especially, sets a new bar for the smart-phone industry, and its clever finger-touch interface, which dispenses with a stylus and most buttons, works well, though it sometimes adds steps to common functions." Mossberg reserves special praise for the iPhone's battery life, build quality and its high resolution display. He also says that the lack of a physical keyboard is a "non-issue". "After five days of use, Walt - who did most of the testing for this review - was able to type on it as quickly and accurately as he could on the Palm Treo he has used for years. This was partly because of smart software that corrects typing errors on the fly." Other areas of praise were the iPhone's web-surfing capabilities and the robust case which managed to NOT collect any scratches, despite being left unprotected in a pocket containing money and keys. What's wrong with the iPhone? "The phone can be a poor choice unless you are in areas where AT&T's coverage is good. It does work overseas, but only via an AT&T roaming plan. 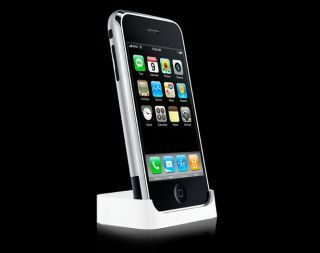 "In addition, even when you have great AT&T coverage, the iPhone can't run on AT&T's fastest cellular data network. Instead, it uses a pokey network called EDGE, which is far slower than the fastest networks from Verizon or Sprint that power many other smart phones. And the initial iPhone model cannot be upgraded to use the faster networks." Mossberg also criticises the phone not enabling you to edit, copy or paste text in Word documents, average call quality and the inability to record video using the built-in 2-megapixel camera. He says that you can't use songs stored on the device as ringtones, watch Flash videos or download iTunes Store tracks directly either. Nor can you use the iPhone for instant messaging (ironic given that Apple already has an IM client in Mac OS X - the operating system the iPhone uses), he said.